Like a pantry staple, ladder-back chairs are quintessential to country chic style. A polished seat becomes a farm-style focal point when a plank of reclaimed pine gets finished in weather-worn ash. The rest gets a pleasant white wash. An inset handle serves a useful purpose when rearranging seating. 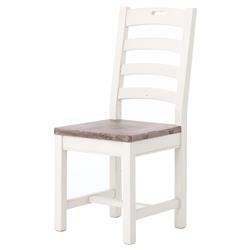 For dining or deskwork, this classic chair gives a contemporary leg to country style.